I must be doing something wrong. 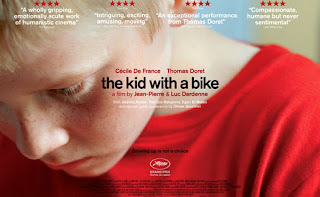 'The Kid With A Bike' is one of the year's best reviewed films and yet, it is easily one of my most-hated films of all time. The film's sibling directors Luc Dardenne and Jean-Pierre may be as critically revered as the Coen Brothers yet on this evidence, I cannot fathom why. Eleven year old Cyril (Thomas Doret) runs away from his care home in search of his father, who chose to leave his son in the care of others, which Cyril stubbornly believes is some kind of conspiracy conjured by the world against him. Cyril's initial search for his father includes a visit to his old apartment, where he not only discovers his father has left but also that he has sold Cyril's beloved bicycle. Once again, refusing to believe the truth, Cyril finds himself chased and cornered in a waiting room in the building. He essentially physically assaults a bystander, Samantha (Cécile De France), before clinging to her leg in desperation. Samantha surprisingly takes pity on the child and invites him to join her on weekends. Before long, Cyril and Samantha's lives become utterly entwined. Cyril is a petulant child for roughly 99% of 'The Kid With A Bike' - a quality made all the more frustrating as he seeks to be treated as an adult, while never acting as such. On the subject of acting, this is one of the areas in which the film actually succeeds - the cast is uniformly solid and naturalistic. Yet this does not save the film from my ire. Cyril's quest for a father figure (and more broadly, a loving relationship) should be a largely sympathetic approach. However, here it is a trial as Cyril sabotages ready-made relationships and openness with inexplicable ease. Indeed, the one person he devotes his trust to is framed as the villain of the piece. However, the true villain of 'The Kid With A Bike' is Cyril himself - imagine Damien from The Omen in a Belgian suburb. Perhaps my failure to connect with the film is a result of a relative lack of compassion and understanding on my behalf. In my defence, I regularly worked with young people from different backgrounds and occasionally, like Cyril, victims of unfortunate circumstance. The spirit and enterprise of each child I worked with inspired me unquantifiably more than Cyril's story. Arguably, the Dardenne brothers skill is in forming a character study that eschews traditional sentimentality but the result is a consistent frustration throughout. 'The Kid With A Bike' is on limited release in UK cinemas now.